Sitting in the late show of Movin’ Melvin Brown’s A Man, A Magic, A Music, I glanced off and saw his silhouette projected against the side wall. Ten-feet tall. Larger than life. I knew that that was how I had to start this review because that’s the best way to describe him. 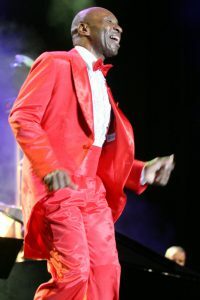 Movin’ Melvin Brown has such a strong personality, he’s exploding with it in every word he says or sings, every tap he dances, every laugh he laughs. A Man, A Magic, A Music, is a 90 minute gift from Movin’ Melvin, telling the stories of his life, cracking jokes, dancing up a storm, and singing. God, can this man sing.